SERVICES - Website of doctorlovejoy! 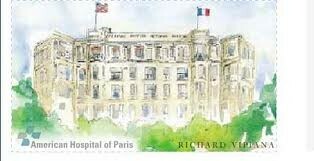 Many new patients are surprised to discover that the American Hospital of Paris has just two American physicians (of 350 total). The AHP does not have an Emergency Room for children. However, it has a Pediatric Surgeon, a Pediatric Anesthes- iologist, and two Pediatric Orthopedists. Also, Dr. Lovejoy was a Pediatric Emergency specialist for 6 years in the U.S. prior to coming to France. Thus, most urgent matters excepting those requiring an overnight stay can be managed by our team. The Pediatrics department also has a Pulmonologist/Allergist, Geneticist, Cardiologist, Dermatologist and Neurologist. Dr Lovejoy can steer you to other outside specialists. He can also help guide you toward a mostly anglophone team should you suspect developmental issues or autism in your child. Routine well-care visits are quite long by current U.S. standards. A full visit includes taking an interim history, assessing growth and development, a physical exam, giving needed vaccinations (physicians and not nurses do this at the AHP), writing any necessary prescriptions, and giving anticipatory guidance and age-appropriate handouts. Many questions parents might have are answered by the handouts. Please see Urgent Visits section. Foreign patients are surprised to discover that French physicians cannot stock vaccines. You will get a prescription for the following visit, and must fetch the vaccines yourself from a pharmacy, maintaining the cold-chain in the process of bringing them to the office. As this can be quite an inconvenience, should your child ever need a visit only for vaccination, feel free to ask the secretary for a "shot visit," which is just 10 minutes and for half the usual fee. In 2013 the French immunization schedule changed significantly. It is best to remain on your home country's schedule, unless you plan to stay in France long-term. If you have a baby at the AHP, please let Dr. Lovejoy know, or have the Nursery staff contact him, and he can perform the discharge exam and explain matters to you in English.